I received a copy of this Bible in exchange for my review. All opinions are my own. This post contains affiliate links. Study bibles have been all the talk lately; people want to learn the bible, they just don’t know how to start. 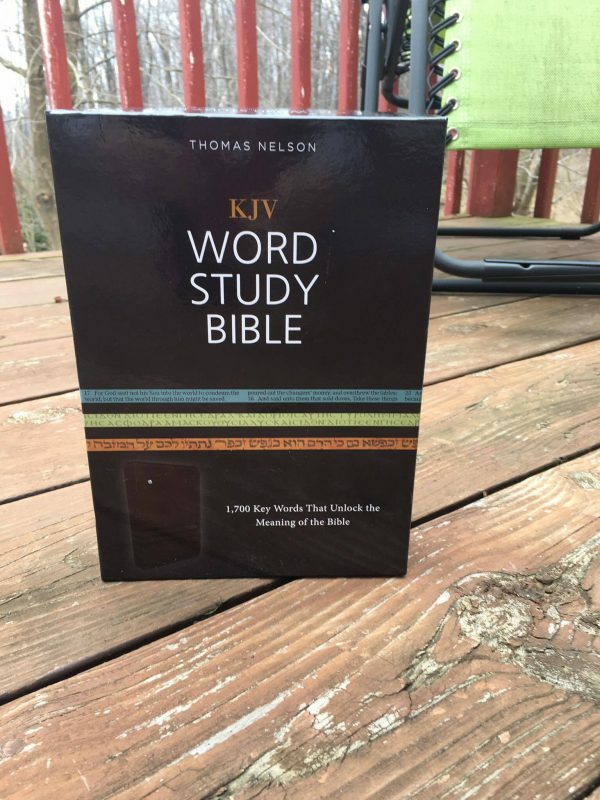 So, when I got the chance to review Thomas Nelson’s KJV Word Study Bible, I couldn’t pass up the opportunity. The KJV Word Study Bible includes in-text subheadings and 1,700 easy-to-use word studies with select Hebrew, Aramaic and Greek words explained in every chapter from Genesis to Revelation, helping you dig deeper into your Bible study. By looking into these ancient texts we are able to read scripture as it was originally written and passed on from generation to generation, bringing these words to life and allowing you to almost hear Jesus teaching on the hillside or crying out to God on the cross. As you study you will discover the richness and significance of the original languages of the Word of God and experience scripture in a whole new way. 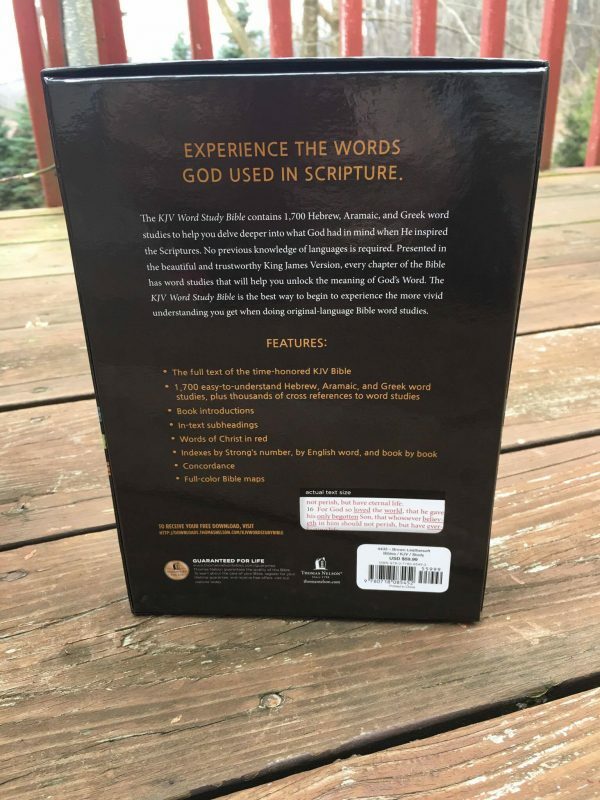 The KJV Word Study Bible is one that I absolutely loved when I opened the box that it came in. 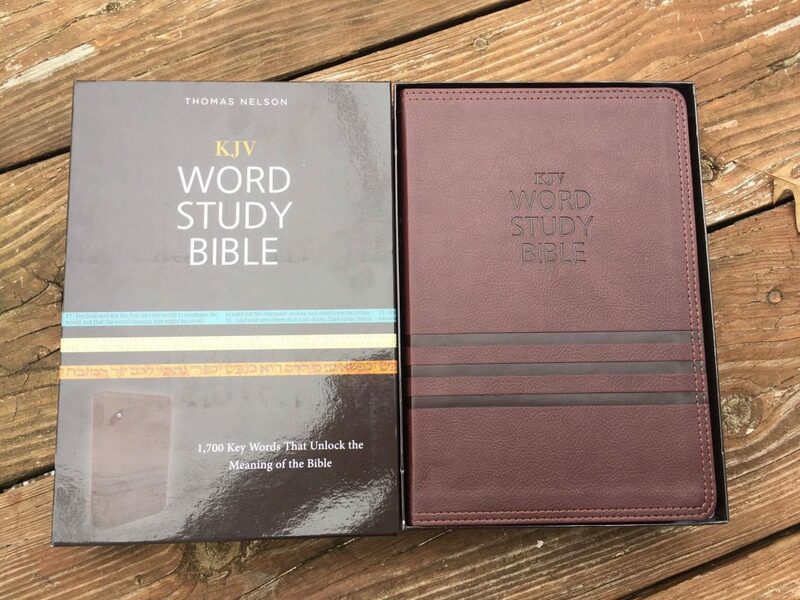 While I have reviewed other Thomas Nelson bibles, the KJV Word Study Bible is one of the most beautiful bibles that I’ve had the opportunity to review. This bible comes in a hard cardboard case, and when you open it, the bible lays beautifully, made out of imitation leather. This bible feels and looks so nice, that it makes it even more desirable to look at. On the inside of this bible, this bible claims to have 1,700 keywords that unlock the meaning of the bible. I haven’t personally tried this method, mostly because I feel like that would be a lot of work, I do want to look further into this study bible. One thing, I kind of feel this bible lacks for a study bible is its version. With it being 2017, I feel like Thomas Nelson should know that millions of people do not favor the King James Versions of bibles. And, for this bible being a study bible, I almost feel like Thomas Nelson Publishers should have used an easier, newer bible version. Other than this being a King James study bible, I love how this bible uses the red lettering for Christ’s own words. I grew up reading bibles with the tradition red-lettering and I feel like it adds more meaning to His words, knowing He actually spoke them. The KJV Word Study Bible is a beautiful bible for families and I would ultimately recommend it.